I first met Mark & his team of PNG Nationals in 2008 at Oktedi when I was on the Tailings Upgrade Project in my role as Procurement & Logistics In-country Manager for Sun Engineering. He & his staff were equal to the most efficient I have encountered in 30 years in the construction industry, & their overall attitude was without reproach. From there in 2010, I introduced him & his Company to my employer ExxonMobil on the PNG LNG Project, in my role as Construction Site Lead, & they again proved to be top class in efficiency & professionalism. 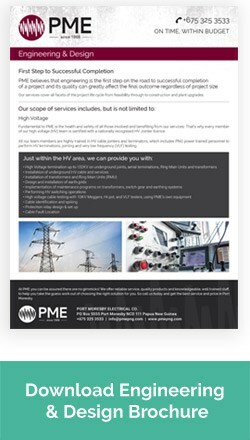 In short I cannot recommend Port Moresby Electrical highly enough. Their attitude & approach to the execution of their designated works & safety is unquestionable. Port Moresby Electrical Company (PME) were selected by OTML to perform the electrical and instrumentation work for the largest project performed on the Ok Tedi Mine since the mine was first commissioned. The project was established to remove pyrite contaminants from mill free and thus prolong the life of the mine while mitigating its environmental impact. The total value of this project was US $200 million. The project was performed to a very tight schedule causing the engineering and procurement phases to overlap construction. Accordingly, PME were awarded a reimbursable cost contract – as were all 3 of the key contractors (civil, mechanical/piping and Electrical/Instrumentation) – to allow work to proceed without the final scope of work established. This implementation strategy worked well. PME’s level of support and commitment exceeded our expectations and play no small part in our achieving operational status in October 2008. Their resourcing was well managed, their field supervision effective, their HSE and Quality Management was sound and their target cost and time control met the project requirements. We recommend them to any prospective client for work of a similar nature to that performed for OTML.